As female pairs, these couples were physically capable of producing twice the number of eggs that other pairs could. Each bird is capable of producing only one egg each year, and so most nests hold only one egg. Yet obrsevers have frequently noted that some nests contain two eggs, in what the biologists call a “supernormal clutch”. Early attempts at explanations speculated that perhaps some individual brds were after all capable of laying two eggs, or that some inexperienced younger females were inadvertently “dumping” their eggs in the wrong nests.. Harvey Fisher, he researcher who proposed this dumping hypothesis in 1968, after seven years of daily observations, justified his conclusion in part with the observation that “after all, promiscuity, polygamy and polyandry are unknown in this species”. 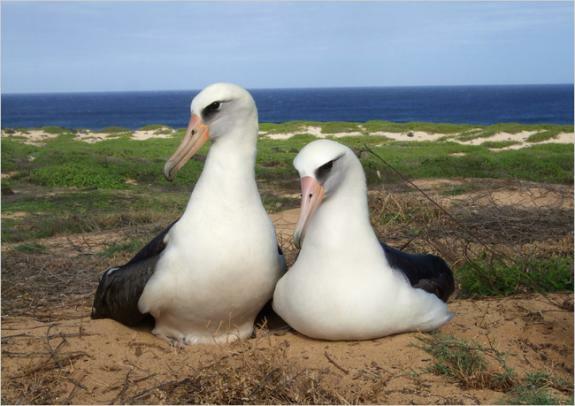 The albatross female couples also illustrate how in the natural world, procreation and pair –bonding can be quite distinct. Albatross pairs, including female couples are monogamous, mutually devoted couples and careful parents: but in some cases, the physical act of copulation is only about fertilizing an egg and nothing more. Previous PostBisexual SnailsNext PostCatholics Support Gay Adoption.